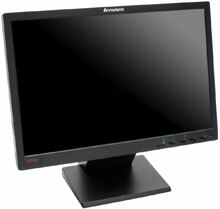 The Lenovo ThinkVision L197 widescreen monitor provides an excellent viewing experience. The ThinkVision L197 offers digital visual interface (DVI) connectivity with high-bandwidth digital copy protection (HDCP) to deliver high-definition viewing of protected contents. The widescreen monitor improves efficiency with easy viewing of multiple applications. The ThinkVision L197 with an EPEAT Gold rating meets the criteria for the highest rating in environmental performance. Available in business black, these monitors coordinate with the Think family design for use with any Lenovo ThinkCentre or ThinkPad system, making it the ideal choice to replace the 17-inch LCD monitor. The Lenovo ThinkVision L197 monitor is best suited for complex spreadsheets, multitasking, general business applications and multiple-monitor environments.